This South Andaman trip on MV Scuba Adventure was a reunion trip of previous customers with a few more joining us. Kath, the tour leader was so happy to see Peter, Hannah, Andre, Matthew and Gareth who had dived with us previously. They were joined by Atle, Kristin, Liina and Orjan. MV Scuba Adventure left Chalong Pier with flat calm seas and headed to Phi Phi where the first dive was going to be as a check dive. The first dive of the day was Koh Bida Nok. We were woken early so we would miss the day boats from Phi Phi. As we dropped in along the NW side we saw a leopard shark just sitting on the bottom. The customers were able to take their photos easily and then we continued the check dive. We really enjoyed this dive as there is so much to see on Bida Nok. 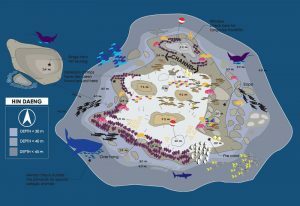 This dive site offers a diverse topography and marine life, so macro is great as well as looking out into the blue to see trevallies and other predators hunting their prey. Dive 2 was on Koh Bida Nai, a sister Island to Kho Bida Nok. So the topography is virtually the same. A few minutes into the dive we were graced by the resident black tip reef sharks. We had 2 swimming around us. 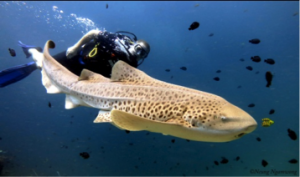 Three sharks in two dives…..must be a good luck omen!!! After the dive we headed for Koh Haa. 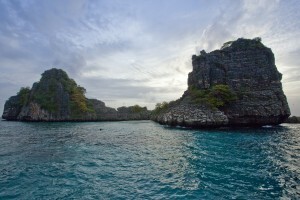 We were going to dive Koh Haa Yai (The Cathedral). When we arrived the National Park boat came to us to collect the money. As they were alongside we heard Captain Pu screaming that there was a Whale Shark and we should jump in and snorkel. Kath jumped in first, but unfortunately it went deep. It was seen by everyone from the surface. Fingers crossed that it would return. 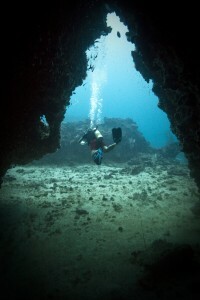 We did the caves at Koh Haa and then continued the dive along the reef. The soft corals here are stunning with a spectrum of colours. A great dive site for macro. Andre and Onjan were so lucky that they saw the whale shark on the safety stop. Night Dive Speciality. The rest of the group surfaced and then Matt and Kath had lights out for 3 minutes. A very enjoyable experience….lots of sparkles in the water. Day 2 and we headed out to Hin Muang and Hin Daeng . Our first dive on Hin Muang was a lovely dive with minimal current and then surprise a manta cruising by. The manta didn’t return and it did look as if it was on a mission!!! Gut reaction was that it was heading to Hin Daeng. Dive 2 with flat calm seas and the sun beating down…need to get into the water. We started the dive along the wall and then…..MANTA!!!! Kath briefed about a cleaning station on Hin Daeng and low and behold the mantas were there all 4 of them. What an incredible sight. Words will never express the experience the divers had. One manta just hung for 20 minutes above a rock whilst being cleaned by cleaner and moon wrasse. The divers were able to take photos and witness something they may never see again. The tour leader was blown away!!! Reluctantly we had to end the dive but we were hoping for more on the next dive and it delivered!!! Next dive on Hin Daeng and a few minutes in the water and then MANTA…sorry no MANTAS all 4 of them just circling on the sloping reef. No need to go any further. The mantas were amazing!!!!! What a fantastic experience. Who needs to see the rest of the dive site? We came for this and Hin Daeng delivered!!! 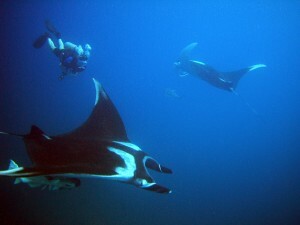 Pete, Hannah and Kath did the safety stop with mantas surrounding them. It has to be the longest safety stop on record. How can you end a dive when there are 3 majestic creatures playing with you? Time to end was when Peter was on 10 bar….. The last dive of the day was Koh Haa Neau. Here there is diverse topography from the limestone to the plate reef. There are copious amounts of anemones here and at sunset they start to close like cocoons showing their beautiful colour. There is a huge school of resident 5 line snappers and twin spot snappers which is a sight to be seen. 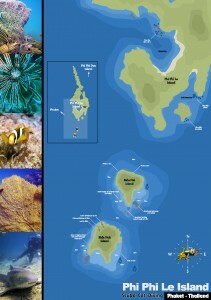 The reef is lovely offering big eyes, lion fish, moray eels and we also saw 2 banded sea snakes. Part of the group turned back at 100 bar to do a leisurely dive back to the limestone area where the chimney was. Kath, Andre, Matt and Peter did the chimney. It goes from 16m to 7m and opens up into a chamber full of big eyes. A lovely experience for divers. Day 3 and first dive on King Cruiser Wreck. It has now become a lovely artificial reef with lots of soft corals and marine life. 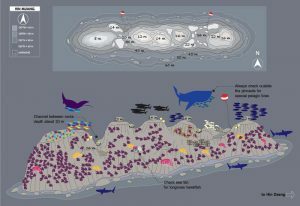 Nudibranch are prolific on the walls and the honeycomb moray eel has been seen here, which is quite rare in Phuket waters. The current was minimal and the dive was great. Next dive was Shark Point. Oh my, what a current…we flew around part of the pinnacle, but then we had calm. Each and every diver was looking at the finer things in marine life. Garth found a nudibranch Kath had never seen before on one of the lines on Shark Point. Shark Point ha such an abundance of marine life. The corals and barrel sponges are stunning. A beautiful dive site even in strong current. Final dive at Koh Doc Mai and a wonderful one it is for macro. We had an easy drift checking out nudibranch, banded coral shrimps, white eyed moray eels, yellow margin moray eels and so much more. 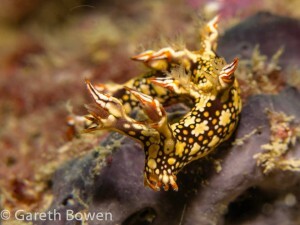 Gareth found a nudibranch that Kath had never seen before. This entry was posted on Saturday, March 8th, 2014 at 12:57 pm	and is filed under Liveaboards, South Andaman Dive Safari. You can follow any responses to this entry through the RSS 2.0 feed. Both comments and pings are currently closed.